Review: "The Rick Ray Band: Killing Time" - Sea of Tranquility - The Web Destination for Progressive Music! 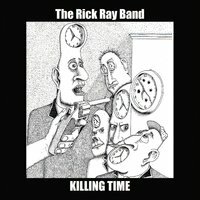 Killing Time is the 33rd release from The Rick Ray Band...just stop and let that sink in for a minute. 33 albums! With the rate that this band have cranked out studio albums over the years, that number would surely be even higher were it not for the six year absence between 2011's Can't Lie Hard Enough and this one, a quiet period that happened for a variety of reasons but thankfully the band have forged on and completed this very solid album. Basically down to the trio of Rick Ray (guitars, bass, guitar synth, vocals), Rick Schultz (sax, clarinet, bass clarinet, wind synth), and drummer Al LeDonne (drums), the band pulled 14 songs out of the many they had written during the past six years and have come up with a very cohesive and enjoyable album. Always a band that 'defied' categorization, they once again cross many styles and textures here on Killing Time. The addition of Schultz years ago added an interesting jazz & avant-garde element to their music, which prior crossed hard rock, blues, prog, and pop borders, and that multitude of genres is what makes this latest release so eclectic and fun to listen to. "Hurry Up and Wait" has some catchy pop hooks immersed within some prog arrangements, while both "Killing Time" and "Hologram" meld hard rock muscle and soaring jazz, Ray's confident guitar licks battling Schultz's sax & clarinet every step of the way. The two rip it up on the energetic "Credits Will Roll", Ray's aggressive vocal not unlike the style of guitar veteran Bernie Torme, while the psych-meets-hard rock of "Hypnotic Spell" is like a wild marriage of Hawkwind and Frank Marino. Other highlights include the tumultuous rocker "End of the Day", the Status Quo inspired blues & boogie of "Rock n Rolex", the bruising "I'm Just Looking", and the moody, atmospheric "Am I Talking to Me", an intriguing number that is part Robin Trower, part Van Der Graaf Generator, and part Soft Machine. With 14 tracks and most falling between 5-6 minutes in length, Killing Time is a long album with a lot of material to digest, but there's a good variety of styles and plenty of sizzling musical passages which helps it all flow nicely. Ray for his part is a tremendous guitar player, and he's given himself many opportunities to shine here, though he never hogs the spotlight one bit, making this a true band effort. For a truly unique listening experience, don't miss out on The Rick Ray Band, and if you are new to these guys, this is a good place to start your journey.